It's been a while since my last post and I've had a few enquiries from readers wondering what I'm up to and if I'm still above ground so I thought it was about time for an explanation. Probably long overdue to be honest. The post title sums up the situation nicely: I just haven't had much to say recently. I haven't taken a photograph for about ten weeks or so and haven't felt any urge to do so. It coincides with my better half, Cath, deciding to join me in early retirement. Far from making use of all this free time and getting stuff done we've sort of kicked back, changed into joggers and slippers (metaphorically speaking) and have been taking it easy. When I'm in full photographic mode I'm constantly on the look out for pictures even when I don't have a camera to hand. I just can't help it. For the last couple of months, that tendency has come to a complete halt. I've just stopped looking altogether. When I realised that, I got a bit worried that I'd lost my enthusiasm and I've resolved to get clicking once more. No doubt, as soon as I get serious about photography again, I'll slot straight back into picture-hunting mode. 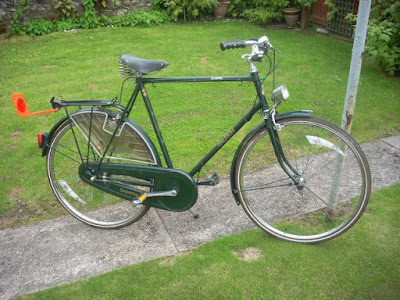 I haven't been completely inactive on the hobby front as I've been working on a couple of my vintage bicycle projects (a 1950s Flying Scot and a 1944 F. C. Parkes if anyone is interested). They're not totally unrelated to my photography, however. If you read my last post you'll recall the idea I have to document the Carse of Gowrie? Well, I decided that the best way of seeing the whole area would be by bike rather than in a car. I love driving and know the Carse very well already but there are plenty of wee dirt tracks and farm roads that are better explored on two wheels. Then there's the opportunity with a bike of stopping wherever I fancy and not having to find somewhere to park a car that doesn't block the narrow country roads. Unbelievably for someone who has enough frames and parts to equip a small Tour de France team I don't have a functional bike of my own! That's because I like bikes from the 30s, 40s and 50s and everything is old and in need of restoration. It's not just a case of walking into my nearest bike shop and buying some bits and pieces: the stuff I need isn't readily available unless I want to ditch the idea of a "period correct" build. I've got boxes of old bike parts but there always seems to be one wee part that stalls a restoration. So I decided it was time to sort myself out and do up a couple of bikes that seemed to be more or less complete in terms of having all the right bits - and that's why my darkroom now resembles a bicycle workshop. The type of bike best suited for the job is one with fat, comfortable tyres, an upright riding style so I can see over hedgerows and "relaxed geometry" for stable handling when carrying a heavy camera bag and tripod on a rear carrier. I had a little bit of Christmas money burning a hole in my pocket and happened across a nice Raleigh Superbe (that's it below) on Gumtree that's about an hours drive away. I made the seller an offer, he accepted and, as soon as he's shaken off the 'flu, I'll nip over and pick it up. It's nothing like the type of bike I normally go for being too modern (1980) and a roadster type rather than a vintage racer but it should be perfect for pootling around the Carse. Plus, the basic design of the Superbe changed very little over its near 60 year life span so a pre-war one isn't much different from the later versions. So hopefully, within a couple of weeks or so, I'll be back out there with a camera and getting some much-needed exercise into the bargain. The pic at the top of this post, which is just for decorative purposes, was taken back in October and was the last print I made in the darkroom prior to its temporary change of use. It's a not-very-original view of Broughty Ferry, a small, well-to-do suburb of Dundee, which I took whilst waiting for Cath to emerge from the hairdressers. The castle in the distance is 15th century Broughty Castle. I was facing east taking the photo and it was mid-morning but I've printed it on the heavy side for dramatic effect. 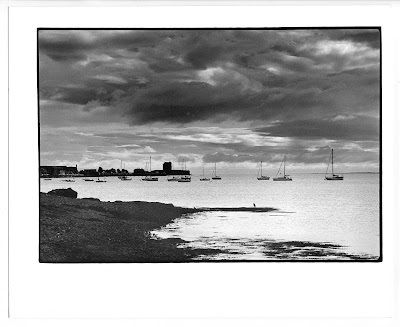 This is a very common view of Broughty Ferry so I can't claim much credit in the artistic stakes. I wasn't sure at the taking stage whether I saw this as a silhouette or with some detail in the land so I hedged my bets and took a shot on auto on the Contax RTS and another at plus two stops. My walkabout camera has morphed into the RTS with a 28-135 Tamron SP zoom, shoved into a Lowepro holster bag. It's not the lightest combination ever but it's very versatile. The zoom is nice except at the 135mm end where the contrast drops off a little. There's a little more distortion as well but that sort of things is to be expected and is one of the penalties for having the equivalent of 28mm, 50mm and 135mm lenses in the one package. However, I was pleasantly surprised at how sharp the lens was at 135mm on this occasion and the pic was handheld at f11. It was really the Cormorant sitting on the wee spit of land jutting into the river in the foreground that caught my eye. It was a case of waiting until it turned it's head so I could catch it in profile and not just record it as a shapeless lump. Exposure on Ilford MGIV FB matt was 5 seconds at f11 on the Leitz 1C. I was using a Grade 4 filter and the sky got a total of another 10 seconds at the same grade to give it a bit of oomph. Hi Bruce - welcome back! That's a cracking picture of the Ferry actually - you've captured the feel of the place very well, so I can say I look forward to seeing more of the same. Delighted to see you back.....that sky-WOW. Good to have you back Bruce. It looks like a perfectly nice bicycle. A set of panniers, with an empty Oxo tin for fish-paste sandwiches and a tartan-covered Thermos (in the good old days, all flasks seemed to have mock-tartan decoration) on one side and a few cameras and lenses on the other would keep the whole thing in period. Perhaps a light tripod strapped to the crossbar for emergencies. A basket on the front might be going too far. Just keep off the pavements. Hello, I also ride old bicycles and take photographs using film. Are you aware of the website http://www.classiclightweights.co.uk/flyingscot.html ? Regards, Norm. Thanks Koen. Hopefully I'll be able to add a lot more content in future. Been laid low with a cold/flu thing recently but just about back to normal now. I knew I wasn't alone! Yes, I'm a regular visitor to Classic Lightweights. I used to be heavily into that scene but not so much nowadays. I still love old lightweights, though. Hello Bruce, it is March, maybe even the beginning of spring in Britain? Time to get one of the medium formats back in use. You can take one of the folders in a small kit bag on one of your restored bicycles. Cheers! Thanks for thinking about me and my bikes, chaps! Another week or two and I'll be riding down every private road in the Carse looking for new material. Eroica Britannica would be great but it's too much of a stretch this year. Maybe next year on my 1944 F.C. Parkes.